Have you ever thought about the convenience and cost savings that come with having an in-house safety consultant? With CertifyMeOnline.net’s training, it’s fast, easy and affordable to have OSHA expertise whenever and wherever you need it. It’s what you’ll receive when you enroll one or more of your employees in CMO’s Aerial Lift Train the Trainer Program. Our online course was developed from an initiative to identify and document Best Practices for Aerial Work Platform (AWP) trainers and operators. It was created with input from the Scaffold Industry Association (SIA) members, along with aerial lift rental companies, manufacturers, associations, educators, regulators, users and operators. Much of the content was adapted from SIA’s February 2010.Statement of Best Practices of General Training and Familiarization for Aerial Work Platform Equipment. With our aerial work platform train the trainer program, we empower managers, safety supervisors and regular workers with valuable knowledge – and most importantly, OSHA compliance! CMO’s aerial work platform Train the Trainer course provides everything needed to have an in-house certified aerial lift safety expert available at all times. Some advantages of our AWP Train the Trainer course include reduced costs, OSHA safety guideline instructions and the convenience of always having an internal safety consultant on hand. Your company will also be better prepared for OSHA audits, have improved safety protocols in place and will provide a safer workplace for aerial lift operators and others working on or near AWP equipment. CMO’s AWP Train the Trainer class that gives you an in-house OSHA approved aerial lift safety expert is a wise investment. Register today for our AWP train the trainer course! It’s fast, easy, and oh-so affordable! Our training programs are used by companies all over the United States for training and certification. What’s Included in Our Train the Trainer Online Courses? 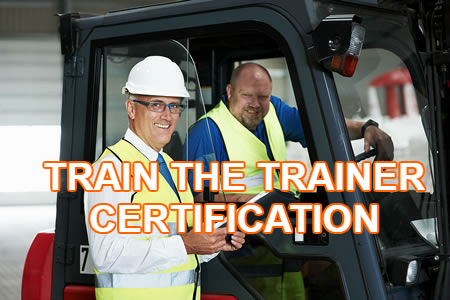 Our Train the Trainer classes will enable your employees who are already certified aerial lift operators to instruct new employees in safety measures and operating techniques set and regulated by OSHA and ANSI. The cost is just $149.00. Our OSHA compliant AWP Train the Trainer Certification Program provides the most comprehensive and convenient way to train your employees. In as little as one hour working from the comfort of their homes, during lunch breaks or any other time and place that’s convenient, your employees will learn everything they need to know to properly educate newly hired operators. As with our other training programs, our AWP Train the Trainer class is convenient, affordable and comprehensive. Once the training is completed, you’ll have your own in-house safety consultant certified to teach OSHA and ANSI safety principles to new employees. Regardless of your industry or business sector, your workplace will be safer. This module will familiarize students with personal fall protection standards, including risk assessment and fall prevention. Our Fall Protection Train the Trainer is an ideal way to obtain OSHA-compliant AWP certification. No other online safety class can match the content and cost-savings advantage of CertifyMeOnline.net training. The following OSHA regulations specify the requirements for fall restraint or fall arrest while working in a boom-supported aerial lift. Employers are responsible for providing PFP equipment and ensuring that it is used properly. – Ultimately, the desired end result of this initiative is to increase awareness of best practices, clarify responsibilities and address the safe use of equipment. – As a qualified trainer, these will be your objectives too. It’s the responsibility of the employer to both provide workers with personal fall protection equipment and to ensure that it’s used properly. Employers also need to be aware of AWP training requirements and where to access approved training materials. After providing the training, the employer is required to monitor operators’ work to ensure the uses, applications and operation of AWP equipment conforms with ANSI standards. Access to the right training materials will make operating aerial lift equipment even safer. It’s the responsibility of AWP equipment owners and users to train their operators. Current ANSI/SIA A92 Standards outline the subject matter to be included in AWP equipment training, but they don’t establish specific requirements for qualifying AWP operators or trainers. If you’re not sure about your current compliance gaps, our aerial work platform train the trainer course is exactly what you need. CMO’s training and certification addresses these issues. CertifyMeOnline.net has everything you’ll need for AWP certification and OSHA aerial lift & boom lift safety training. When you sign up for our Aerial Lift Train the Trainer online course, there’s no more worrying about a surprise OSHA visit – you’ll have all the safety knowledge and training expertise you need within your workplace! Get started today with CertifyMeOnline.net’s AWP Train the Trainer course. Have questions or need more information about our aerial work platform Train the Trainer training module? Call us at 602-277-0615 – we’re here to help!